It rained a bit, at last, and it smells of Autumn. I don’t know if this is going to last though and summer seems to have lasted for ever. I started experimenting with making caramels, and this is my first attempt ever. I found the recipe on Saveur and it clicked but was too reluctant to make it. But as part of trying to step out of my comfort zone lately, I decided that I would give it a try. What would be the worst thing that would happen? (Besides burning my stove? I would just keep on standby my fire extinguisher). As part of stepping out of my comfort I started this blog and aerial yoga and I haven’t regretted any of those choices (yet). These caramels are sort of like the typical caramels you probably ate as a child, but with a hint of coconut. They are rich and melt in the mouth. They are rather on the chewy-rubbery side, something that some loved, but others hated. You will need a candy thermometer and some patience. Line a 20×20 cm square baking pan with parchment and grease the parchment with coconut oil. Combine the coconut milk, corn syrup and sea salt in a medium sized saucepan/pan. Heat over medium low, stirring constantly for 2½-3 minutes until mixture is just warm and any coconut milk clumps are dissolved. Remove from heat and set aside. In a big pot, combine the sugar and the water and stir until sugar is wet. Place over medium high heat and let cook, without stirring, till the sugar turns a light amber color and a candy thermometer reads 154°C/310°F. Immediately remove from heat and pour melted sugar into the coconut milk mixture. Be careful, as the mixture will bubble and splash. Return pot to medium low heat, stirring continuously until all the caramel is dissolved. Raise the heat to medium high, and cook until caramel becomes quite thick and a candy thermometer reads 116°C/240°F, stirring frequently. This may take a while. Immediately remove from heat and pour into the prepared pan. Let cool completely and cut into squares. 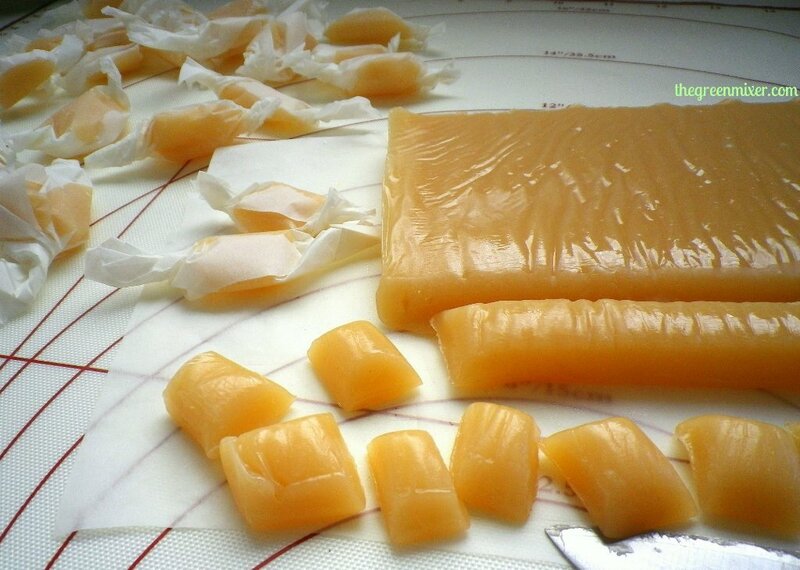 Brush your knife with melted coconut so that it doesn’t stick to the caramels. 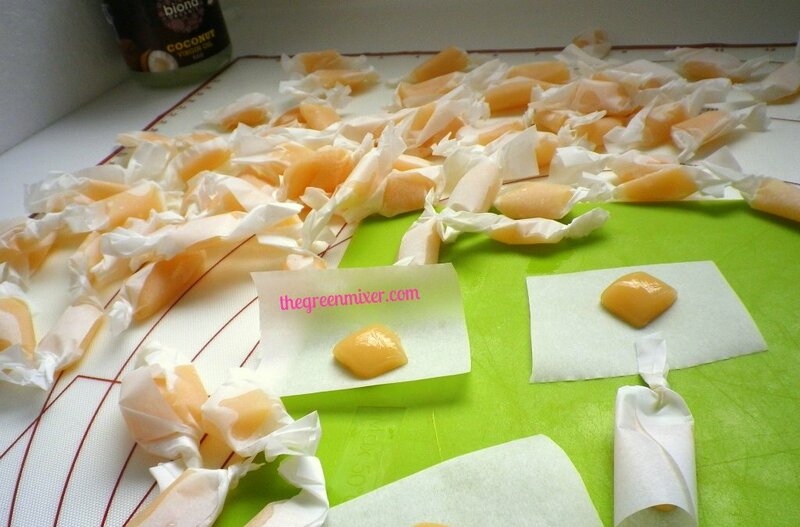 Wrap individually in wax paper squares and store in an airtight container. “…until caramel becomes quite thick and a candy thermometer reads 1116°C/240°F, stirring frequently” … I think one ‘1’ needs to be removed from the Celsius reading. Stumbled upon this recipe as I was Googling for “coconut milk candy”. Looks good, will try it sometime. Thank you. Thanx Audrey for noticing it!! !